Just to make it clear, I’m going to say that there is some merit behind some copyright. A way to ensure a return on effort spent to produce the piece of work. That being said, it should not be the same right for every piece produced. I don’t really need any sort of scientific survey to look into part of this. Most copyrighted material is absolutely worthless. However, is it afforded the same protection as a major blockbuster movie, for free. Depending on how I structure the copyright of this blog, it has the same protection as Transformers 3. Why? To me this doesn’t make any sense. Which is why I’ve decided to license my blog with a creative commons license. You can see it down at the bottom. However, I still got that copyright with no effort for myself. I have to do nothing to keep that copyright. The arts, sciences and technologies have had a strong interaction on each other throughout human history. We can see this with how our arts are pushing our technological limits. Video games push the limits of personal computers, recording studios push the limits of audio equipment and flawless video push the limits of TV and cameras. However, for any piece of art that was created on any of these technologies, they are afforded much more protection than the technology. The art also gains this protection for free, without any effort, whereas the technology has to go through a great deal of work to prove its worthy of the protection. As much as I would like to remove the auto guarantee of state protection on a work, I don’t think that’s feasible. However, I do think what is feasible and realistic is implementing a registration requirement for works older than a year old. This minimum level of effort demonstrates, at least to the owner, there is value in the copyright. If the content creator fails in this, the work should fall into the public domain. Thus freeing the vast majority of our culture from copyright. In the patent system there is a minimum cost for renewing the protection each year, which is considered the minimum value of a patent. This scale is graduated so that the the longer you want the protection the more expensive it is. For most firms this isn’t really that much money. I think we need to add something like this for copyright. However, our current copyright length is extremely long. Which brings us to another point, after 20 years, which is the maximum allowable protection length for a technical discovery, the yearly rates should be exorbitant. In the last 10 years the copyright should cost more than $1,000,000 per year to manage. There will be firms that are willing to pay it, but it will be a difficult choice. Because it would be for every single copyright. This would quickly reduce the numbers of items within copyright protection. I also think that there should be a payment difference for levels of protection. So this goes a bit to the different types of creative commons licenses out there. However, I think the most basic cheapest level of protection is required source acknowledgement if remixed, and the right to license out the work. Anything more than that would be extra money. So, if you didn’t want it remixed for profit you would have to pay a significant amount of money more. Again, this is per copyright. There wouldn’t be any blocks for works on a CD as each song can be sold separately, which would require a separate registration. I think with a system such as this we would quickly understand what the true value of a copyright actually is. At this point we have an artificially high valuation of copyrighted material based upon an extremely small subset of copyrighted material. 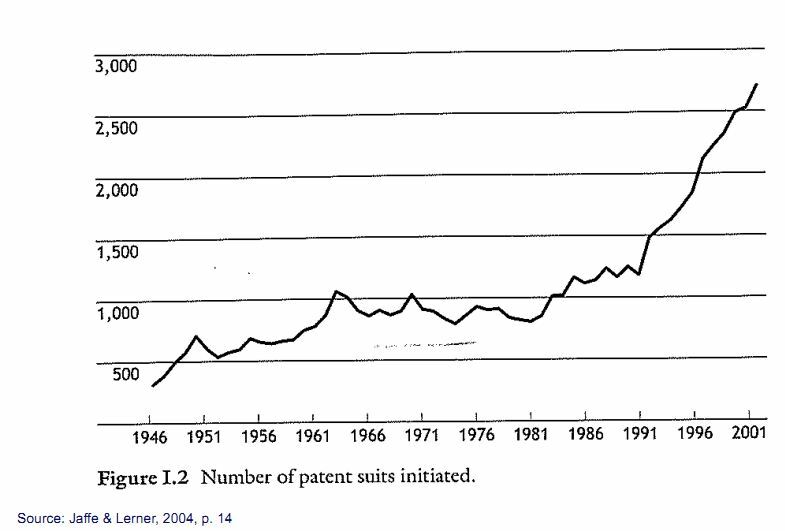 From my previous post on the value of patents, we saw that most patents were barely able to cover the value of owning the patent. Additionally, most wouldn’t cover the cost of litigation. We need to come to accept that most of our art at some point becomes economically worthless, if it ever was. That’s not to say it’s not emotionally full of worth, however, we can only truly understand that value when we have easy open access to it. I’ve been a bit remiss with my blogging of late and managed to miss discussing this pretty big story. CERN, the European particle physics group, has evidence that there might be Higgs particles. What are Higgs? Well, they are theorized to provide mass to all other particles. Not only has CERN reported this, but Tevatron in Chicago at Fermilab has reported seeing similar, but smaller results. This is very good news. In fact, despite the fact that Tevatron (6.3km) is no where near the size of Large Hadron Colider (LHC) of CERN (27km), which means that it can produce less power, can detect it means that there’s a lot of room for further investigation at LHC. This is exciting. What if Higgs doesn’t exist? Well, basically it means that the Standard Model of particle physics is partially scrapped. Only partially, because a lot of the theory has been supported through the research at institutions like CERN and Fermilab. However, the evidence is pretty good, however, the scientists are being extremely cautious. They are currently at 2.8 sigma on a normal curve (bell curve for grading). For most research this error rate is more than enough for it to be considered a significant finding, 99.9% likelihood, however in particle physics significantly higher results are required. They require 5 sigma, which is about 1 in a million. Does this impact my daily life? No not really, however I’m very sure whenever some of the original atomic theories were put forward and verified, most people didn’t see much use in them. It might take us a large amount of time to figure out how to actually use this. For all we know some of these developments may lead to a better understanding of fission in some way. I’m speculating of course, but there’s no reason to assume that this research is good for just doing more research. In the United States cutting edge particle research is drawing to a close I’m afraid. In October of 2011 Tevatron will shut down for good, and there are only a few other large accelerators in the US, none as large as Tevatron.This will likely have long term impacts on both theoretical physics and particle physics in the US. The expertise will leave Universities like University of Chicago and move over to Europe to work with CERN. This didn’t have to be the case, but in 1993 Congress scrapped the Super Collider in Dallas, the US gave up the desire to lead in particle physics. Congrats to both Fermilab and CERN for coming so close to detecting the Higgs boson! My heart goes out to Norway. I’ve been doing a lot of reading about this, there have been tons of blog posts speculating the reasons that drove this man to commit these heinous crimes. Over on /r/atheism there’s discussion that atheists should be pointing out that this was a christian terrorist and work to ensure that the name sticks. They are saying that our media uses different words because he was christian compared to muslim. In the US this massacre will no doubt bring up debates about restricting gun usage and access. However, Norway has some of the strictest gun laws in the world, and it clearly didn’t help. This blog post helps explain the extent that this man went to in carrying out this violence. Additionally Al Jazeera has an interesting op-ed lambasting NYT for quickly claiming it was a muslim terrorist then switching to christian extremist. My take on this is a bit more complex. The op-ed writer claims that it’s not a battle between Islam and Christianity but a battle between extremists and the average person. While he is correct in that, it’s not as simple as we’d like it to be. Unfortunately, differences in religion and cultures make it very difficult to figure out ways of dealing with these problems. Misinformation has spread so there is a lack of trust between your average person in the west and in the middle east. Bridging that gap will be difficult. In europe there are additional problems. In many articles there are discussions of the lack of integration of different groups of immigrants into European countries. Some of these groups have the highest rates of criminality in the country. For example in the Netherlands Moroccans are the group with the highest level of criminality in the country. They have not integrated well at all. However, this is a two edge sword, as in many cases they aren’t allowed to integrate. One of my friends told me about a friend of his roommate’s that is Moroccan and even though he was born and raised in Amsterdam he is excluded from most bars because he is Moroccan. These problems are extremely difficult to deal with and the stereotyping and racism can lead to extremism. This is what we’ve seen in this case. In the US, it was fueled by the Tea-Party, Beck, Palin and other politicians, in the Netherlands it’s been fueled by Geert Wilders, and unless we can figure out a way to make them feel responsible for the anger they entice and inflame we are not going to see these messages stop. That’s only part of it. We need to work together to create a way for both groups of people to integrate. Requiring immigrants to take language courses is a way to do this. However, at least in the Netherlands, they are extremely expensive and many of the workers are working class and may not be able to afford the courses. So, perhaps some integration programs by the government will help with this. Additionally, to help with cultural issues using full immersion courses would work best. These courses can help teach the history of the country and about the cultural heritage of the country as well. This will ease the transfer from the previous living environment to the new one, as well as make the new immigrants more likely to integrate. Who is going to pay for that. I don’t know, most likely the immigrants and recent immigrants. However, this won’t address a lot of problems. Specifically how do you deal with people like this Norwegian guy? I’m not sure. But I think addressing the ability of immigrants to integrate may help a great deal with these problems. I think we’re in the middle of a very bad convergence of cultural inhibitors. Most things that would fall under the purview of culture is copyrighted. Historically, we never had much trouble with this as individuals. However, now we’re seeing more and more problems with this. As I’ve discussed in the past, ICE is heavily involved, individuals like James O’Dwyer and Aaron Swartz are in the middle of two different kind of legal action and content owners are coming up with new ways to control their material. What do I think is going on? I think that we could be seeing the end of our ability to freely use our culture. We are also seeing the US attempting to govern the world’s copyright law. For instance, the US is seeking to extradite O’Dwyer over a links page, something like Justin.TV, which in the UK isn’t illegal and no one is sure if it’s actually illegal in the US or not (See this ars technica article for more information). This isn’t the only case like this. ICE seized a website that was declared legal in Spain. One of the best parts of the copyright law for consumers is the First sale provision. This allows a consumer that owns a book, but not the copyright, to sell this book to some one else. Or do with this book anything they want to after the first sale. However, we’re seeing this ability erode away. Autodesk, makers of AutoCad, are suing a guy that is trying to resell a two copies of AutoCad. They are claiming it violates their copyright and their End User Licence Agreement. Digital Rights Management (DRM) is another manner in which content owners are exerting excess control over their content. If you bought a song from iTunes, that DRM is going to last longer than the copyright which it is absurd in my opinion. Another case where DRM and content ownership is going to have a long term negative impact is in the PC gaming industry. There are a few major platforms for game digital game distribution. Steam being the largest, however all these games are put into a walled garden of “ownership” where you are able to play the game and use it, but you aren’t in control of the actual content. You have absolutely no ability to resell the game. In the past, if you didn’t like a game after you bought it, you had the ability to sell it for a loss to some place like Gamestop. With these online platforms you don’t have the ability to do that, as it would cannibalize sales from Steam itself. Other services are starting to get into the act to prevent copyrighted materials from being sole without the owner’s consent. Today, PayPal has decided to ban payments to any website that is illegally selling copyrighted material (Torrent Freak article). This is pretty serious. As a company the have the right to do so, and I’m very sure that there will be some other service that will provide secure monetary transfers. Based on these observations, I believe that our government and content owners are working to control and limit the freedom of usage of our own culture. It’s not a conspiracy, as the government is actively working with RIAA and MPAA to help regulate the material. ISPs have recently gotten involved in the game as well (EFF commentary). These groups are working to use copyright to gain more control over the material every day. What can we do? Contact your government officials, get educated through EFF and Creative Commons, and other organizations like this. Aaron Swartz has been arrested and accused of a multitude of crimes, for a break down of them go here, for gaming a big journal retrieval site called JSTOR (it is a large one many journals are stored within this site). As some one that works with these retrieval services quiet often and has actually hit the limit for the amount of citation data you can pull from them, they can be frustrating. Some of the work I’m personally doing right now is related to citation analysis and co-authorship analysis. Which allows networks of knowledge flows to be seen. Another method is to do a word analysis within articles to create knowledge networks based on what articles are about, what knowledge is contained in each of the articles. Apparently, in the past, Swartz has done something like this. Some of my colleagues also use techniques to allow additional gathering of information. Most of this information, even with you have legal access, is difficult and very time consuming to procure. In this case, Swartz has access and may have been able to get a hold of this data through other means. JSTOR mentioned in one of their releases that they have a program that allows for high volume access to their publications. This case also has made me think of a few other issues with our current knowledge retrieval systems and repositories. Companies need to make money off these publications, so we can’t have them for free. However, through my research, I’ve used articles that are 20 years old. If this knowledge was patented, I would be able to access this and use it with no problem at this point. In many cases, it could happen sooner as many patents aren’t renewed after a certain time frame. Using a scientific article is typically more like using something published under a creative commons license, which means you can remix the information. Through citations you give credit where it is due. In most cases you can get access to the data and models, if you give the person credit, either through citations or co-authorship. Why does this work? Because the research is publicly funded. Authors can also pay to allow full free access to their work depending on the journal. However, in most cases they don’t, or don’t get the article to be free continuously. However, there is some relief from the burden of paying for individual articles, Google Scholar, is able to find articles that scientists have on their personal websites, and allow access to “working paper” versions, which means they aren’t quite publishable yet, even after they have been published. I think for publicly funded research we need to have an exception to the copyright law, which changes it from 70 years to 10 years. Depending on the field even 10 years is to long. The work my wife is doing articles cited which are that old are typically cited because it’s giving credit to trail blazers. These papers are typically cited in the hundreds compared to the average of the tens. Once the copyright expired there would be much more competition for distribution of the articles and reduces the risk to the knowledge community if any given retrieval system or journal fails. This Swartz case scares me in general, because it will make it even more difficult to access information and care a large risk if you create scripts to make it easier to get access to massive amounts of data.